There was a fantastic international flavour to the 5th annual Foden’s Band Solo, Duet & Ensemble contest held on the 31st October at Sandbach School with over 150 entrants performing in various categories in what is now the largest event of its kind in the country. Competitors travelled from as far as Norway, France and Belgium to compete for the various prizes and awards on offer including Jonas Violet and his father Frans, the conductor of Brass Band Willebroek. . 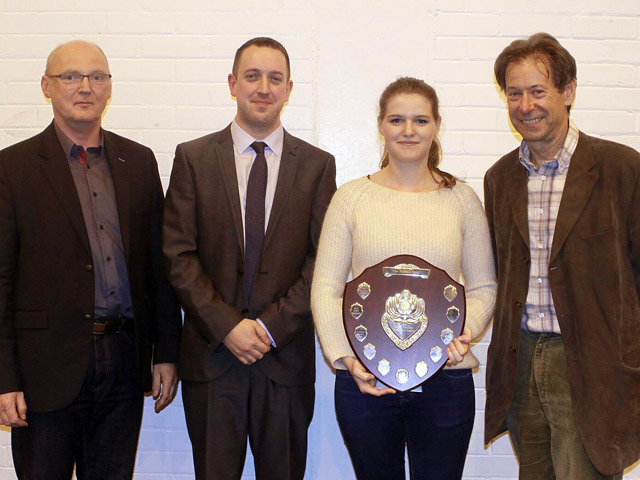 The trip to Cheshire was certainly a memorable one for the talented Gaelle Lefevre from France who claimed the Blue Riband Besson International Prize in superb style. Despite her luggage not turning up with her at Manchester airport on the same flight, Gaelle still produced a wonderful winning performance to gain a trip of a lifetime to the United States to tour as a guest soloist with James Gourlay and the Pittsburgh based River City Brass Band. Foden’s Band members were kept busy organising the setting up of classrooms and main hall, registrations, managing the trade stands, comparing duties in each section, manning all 4 performance areas and practice rooms as well as serving on the refreshment stands. Band members also provided some of the fine food on offer from classic bacon sandwiches and hot dogs to homemade soup and an amazing array of cakes and pastries. Major sponsorship support once again came from Besson Musical Instruments, with Werner Duwe, Director of Brass, on hand to enjoy the action and to help with the presentation of awards as well as Audi Macclesfield and Cheshire East. Band Supplies Leeds, Birchfield Music, Astute Music and Added Brass were all present providing Trade Stands. Besson’s support also enabled the competitors to be judged by world class musicians such as Owen Farr and Florent Didier. Owen chose euphonium player Adam Bokaris as the ‘Most Outstanding Performance of the Day’ winner. He also took the ‘Open Slow Melody’ title playing Andy Scott’s ‘Fujiko’ to take the ‘Outstanding Euphonium of the Day’ award, with Andy donating a set of solo music to Adam to help him further with what promises to be a burgeoning solo career. Professor John Wallace CBE (a Vice President of Foden’s) and his father were also on hand, as they recalled the happy memories of their own slow melody competitions days in Scotland. Prof Wallace spent much of the day listening to the younger players, and was full of admiration for their excellent efforts. He also delayed his return home so that he could attend the awards ceremony, and present the Blue Riband prize to Gaelle. Former Foden’s flugel star Helen Williams, now at Cory Band, also travelled up from Wales to adjudicate a number of the young classes, and as usual was full of enthusiasm and encouragement for the players she listened to. Contest organiser Fiona Rolfe commented that once again the Foden’s contest had shown that there was an increasing demand for an event with an undoubted worldwide appeal. “We continue to grow thanks to the wonderful support of our partners – especially Besson Musical Instruments, Cheshire East and Audi Macclesfield. This year’s competition gained a great deal of publicity and with the invaluable support of our traders and sponsors we continue to welcome players from all over the banding globe. Foden’s is dedicated to ensuring that we provide a contest that gives players of all ages and abilities the opportunity to shine and enjoy their performance experience. That is why we have a panel of judges of renowned musical experience who not only provide detailed adjudications, but give invaluable advice. We believe in providing the platform for future generations to go on and enjoy either playing in a brass band or to become life-long brass and percussion musicians. Next year’s competition will be on Saturday 29th October 2016.